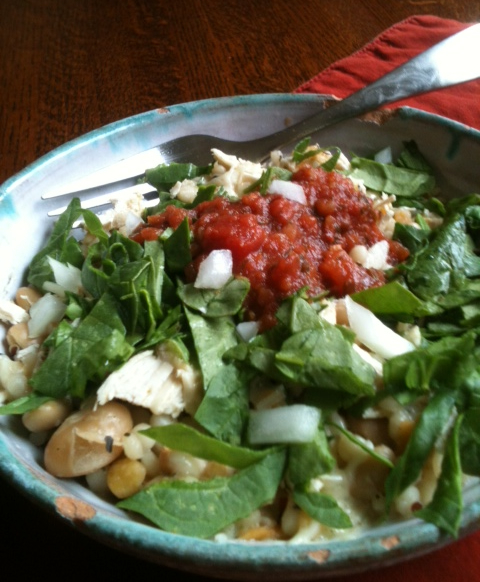 One of my favorite lunches in my favorite old bowl = comfort. I don’t “do” Trader Joe’s. I know, I’m weird. I try to be a Joe’s girl, I really do! I go, I look around, and never really get much. Oh sure, the list of things I WANT to buy is long; macaroons, cute little frozen enchilada thingies, cheap wine and chocolate covered everything. I know there are healthier gems in there, but I don’t go enough to really comb the isles and seek them out. I wait for other moms to gimme the, “Hey, you GOTTA try this” review. 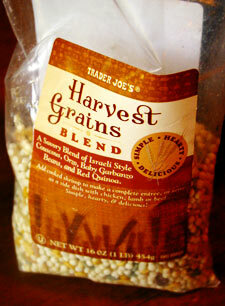 My bestie sent me a bag of Harvest Grain from Trader Joes all the way from Arizona. She wasn’t convinced I would actually go buy it myself since I’m TJ-challenged, so she stuck it in the mail. I use it as a base for lots of dishes. You can pile anything on it sauce-wise. It’s got Israeli couscous, along with red and green orzo, split dried garbanzo beans, and red quinoa. I like to whip up a batch, add proteins and have it all week long for a quick heat and eat lunch after a workout…or cold if I’m on the run. As many of you know, I’m a “savory” and love it for breakfast too with an egg on top. Make as much of the Harvest Grain as you’d like per package directions. About 1/2 a bag does me for 3 or 4 lunches. After it’s cooked, spoon a cup or so into a bowl, top with protein (tofu, chopped, cooked chicken or turkey if desired), add shredded cabbage or chopped raw spinach and add another sauce if you want. I love salsa on mine. – any ol’ thing you want! Of course, it’s really yummy with a chocolate covered macaroon. Hey, who said that? • i’m a runner, you’re a runner, wouldn’t you like to be a runner too? This sounds like yummy healthy comfort food (that my kids would flee from, unfortunately). Do tell about the “Harvest Grains Blend” blend. What’s in it? I’m guessing we’d have to find a substitute for my gluten-intolerant hubby, but If we can figure something out I’m going to give this a try! Sorry, I was scarfing it while writing about it, but forgot to include what’s in it. It’s got Israeli couscous, along with red and green orzo, split dried garbanzo beans, and red quinoa. You could make your own blend too I would guess with gluten-free options. Might be fun to experiment. You know, cuz you have tons of spare time 🙂 How is you, girl? Still on track to run that marathon? Sounds good Laura. Reminds me of my favorite Soylent Greens, comfort food – darn right! I still like my sweeties for post workout breakfast: oat sesame pancake w/ banana, blueberries and walnuts. Plain greek yogurt w/ maple syrup.